Behavior change is the key to having a successful wellness program. The best employee wellness programs keep the focus on the need to help employees adopt and maintain healthy behaviors. Behavior change is the key to reducing health risks, reducing the prevalence of chronic disease, and reducing employee related expenses. It is impossible to have good health unless you have healthy behaviors. There are many factors that determine how healthy we are, but none of them are as important as our behaviors. Large epidemiological studies that include hundreds of thousands of individuals give us all the information and rationale we need to keep our focus on helping employees change behaviors. Between 70 and 90% of all strokes, heart attacks, cancers, and type II diabetes are directly related to what we eat, whether or not we exercise, and whether or not we use tobacco. This means that the majority of chronic diseases that we suffer from our caused by putting the wrong kinds of things in our mouths, not moving around enough, or consuming tobacco products. If lifestyle choices explain 70 to 90% of all chronic diseases then what explains the rest of the chronic diseases not covered by this research? It’s true that there are other non-modifiable factors that can influence chronic diseases. 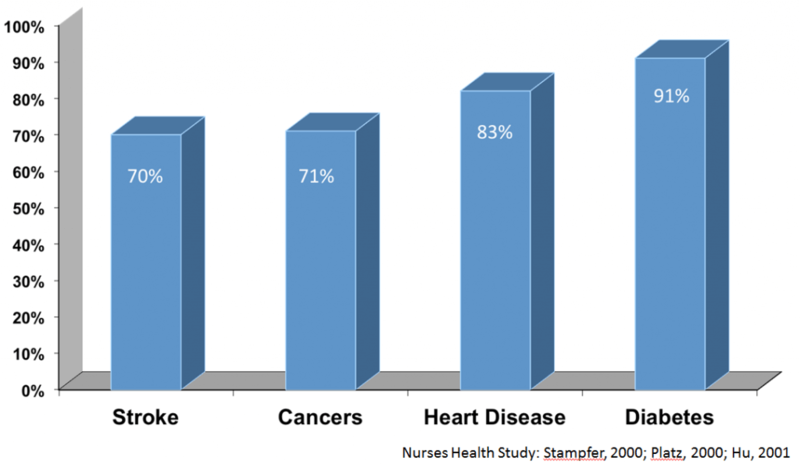 Genetics, for example, explain between 3-6% of the chronic disease burden. And there are other environmental factors including where we live, the air we breathe, exposure to toxins, and workplace hazards that can have an impact on chronic diseases. Having a genetic tendency towards high blood pressure, diabetes, or high blood cholesterol is very real for some people. but for most people it is very unlikely that they have a familial tendency to have any certain chronic disease. I often hear comments from individuals that they share common health factors with other family members. I am often told, “Dr. Aldana, my brother has heart disease, my mother has heart disease, my father has heart disease, and we think that some of our grandparents also had heart disease. I must live in a family that has a high genetic risk for heart disease. 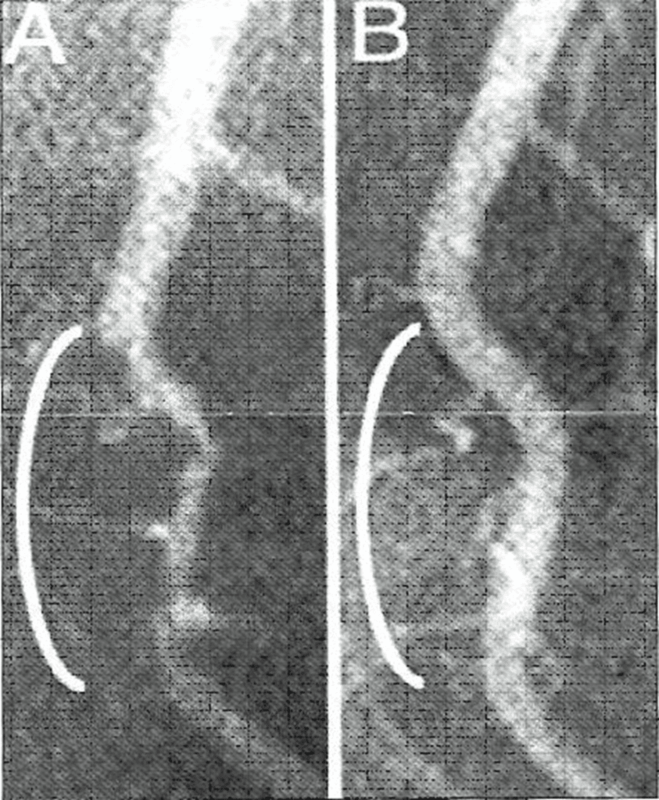 Clearly, I must have some kind of heart disease gene.” While it certainly is possible that this individual has inherited a genetic predisposition towards cardiovascular disease, it is also equally probable that this individual, and all his family members, share the same lifestyle choices. They live in the same community, they eat the same foods, they share the same exercise patterns, and they may or may not consume tobacco products; in other words, is not possible to discern if heart disease in his family is due to genetics or a shared unhealthy lifestyle. And in reality, it doesn’t really matter which one it is. The solution is the same: we need to help individuals adopt and maintain healthy behaviors. In some cases, risk-reducing medications are required, and taking a medication is a behavior. Medical and wellness professionals face the same challenge: help individuals make healthy choices. Consider elevated health risks such as high blood pressure, high blood glucose, or high blood cholesterol. Most of these risks are caused by poor nutrition, lack of physical activity, weight gain, stress, tobacco use, poor sleep habits, and other health behaviors. Elevated health risks lead directly to the development of chronic diseases—diseases that take a lifetime to develop and which ultimately end in death. These are the major killers within our society and include cancer, cardiovascular disease, Alzheimer’s disease, type II diabetes, stroke, digestive disorders, and many others. Individuals who have chronic diseases require intensive medical interventions, may have poor quality of life, and may not be as productive as they could be. 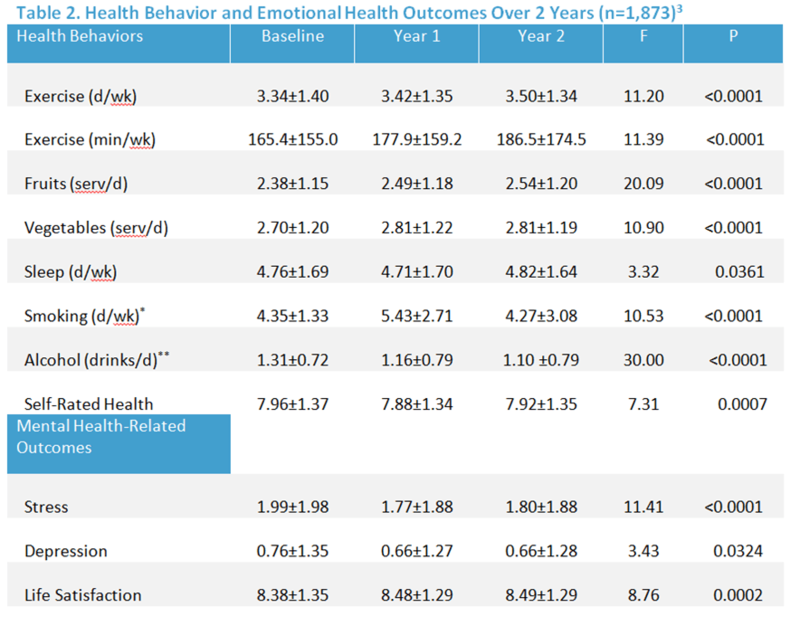 This relationship between behavior and employee related expenses and poor health is easy to understand and accurate. The scientific evidence that links unhealthy behaviors with disease, elevated health risks, elevated health care costs, and poor quality of life is extensive. This research also helps us understand why wellness programs that focus on improving health behavior are more likely to be successful. The challenge for all of us is to figure out how to get people to adopt and maintain healthy behaviors. Changing health behaviors is perhaps the most challenging exercise any of us will ever complete. Not too long ago, Dr. Michael O’Donnell introduced a simplified behavior change model designed to help worksites improve employee health behaviors. The name of this model is AMSO, (Awareness, Motivation, Skills, and Opportunities). This simple model helps worksites create an effective wellness program that improves employee health. The four components are pretty easy to understand. Awareness and education is the “what” of behavior change. The motivation is what drives us to change. The skills and tools portion is the “how do I do this?” part, and the culture and environment part is a conglomeration of environmental changes, policy changes, and support from others that all help us to be successful. Which one do you think is the most powerful and helping people adopt and maintain healthy behaviors? 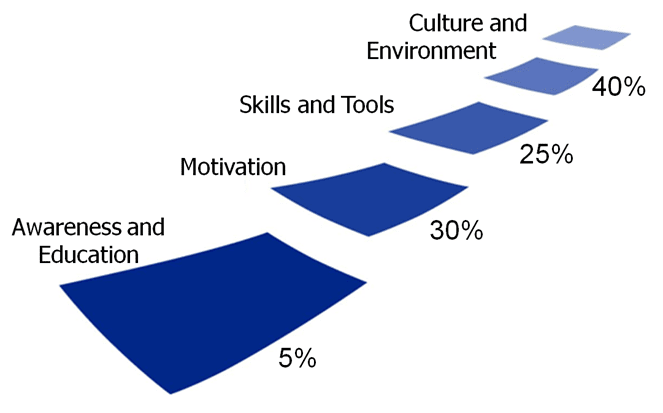 As you can see in the figure above, the most important part of the behavior change process is actually culture and environment. About 40% of the success of behavior change happens when we establish a supportive environment and when we receive peer support from others. The least important aspect of this model is awareness and education at just 5%, yet this is where most wellness programs spend most of their time and budgets. Let’s take a deeper look into each one of these components. This blog is an example of how awareness and education can work. As you read and look at the images you are becoming aware of and educated about the WellSteps approach to successful wellness programming. I am trying to convince you that your wellness program success will hinge upon whether or not you’re able to help employees improve health behaviors. Hopefully the content you’re reading is helpful, but just providing awareness and education is not going to be enough to help you, the reader, implement an effective behavior change program. You are also going to need to be motivated. Here are three images can be used dealt motivate people to change behaviors. Not one of them is associated with a monetary incentive and yet they can be very powerful agents of change. Here are two recent blogs that provide the best information we have available on how to motivate employees with the use of incentives. These are the exact steps we use at WellSteps with all of our clients. I do not know of a better way to motivate employees. Having employees bring in food for a healthy potluck will expose employees to different ways of cooking healthier options. 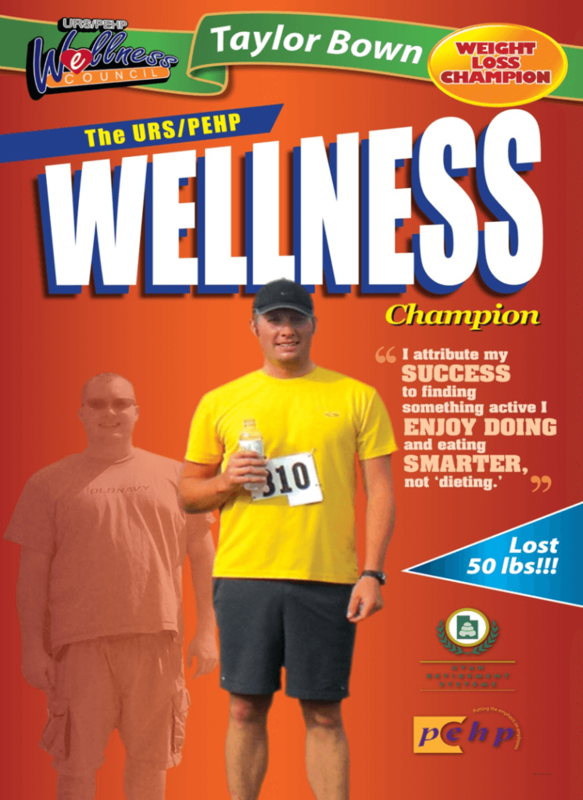 One of our more popular WellSteps campaigns uses the Stop and Go Fast Food Nutrition Guide. It’s FREE to everyone with a mobile phone. This campaign gives employees the skills they need to navigate the fast food world and make the healthiest selections possible. There are lots of tools that are our disposal to help us eat right and exercise regularly. You don’t necessarily have to buy all the required tools for your employees but you do have to educate them about how the tools can be used and where they might find them. For example, employees who want to walk at lunch could use a map of the local walking trails and paths to help them find the right location and distance. A map of the local walking trails or paths is a tool that can help them accomplish their goal. The last step of the behavior change process is the most important one. It’s not just about changing the culture and environment, it’s about altering policies of the worksite, creating social support, and changing the physical environment. It’s the most important because it has the largest impact long-term on helping people have healthy behaviors. Nationally, about 21% of the population smokes cigarettes, but in California the smoking rate is about 9%. Why is the smoking rate in California so much lower? The main reason is because the state of California has implemented a variety of smoking policies, more than any other state. There are few places where a person can smoke in California. You cannot smoke at the beach or in a public park; your car and your own home are about the only places you can legally smoke. Strict policies are not necessarily the solution to having a successful wellness program, but carefully crafted and supportive policies are. Having healthy food options in a company cafeteria is a policy. No one is being forced to eat healthy foods, but at least the healthy foods are present, and in many cases they are sold at a lower price point. This policy makes it easier for people to purchase and consume healthier foods over less-than-healthy foods. Creating health-promoting policies and environments at work is something employees can participate in. The worksite wellness committee needs to meet often to talk about how to create a healthy environment at work. This discussion can include changes in policy and actual changes in the environment. It can include providing opportunities for employees to be physically active, mapping out walking paths or bike paths, establishing tobacco free zones and a tobacco policy at work. It includes helping employees find a safe place to exercise, or providing them with convenient access to healthy, inexpensive foods. There are a variety of things every company can do to change the policy and environment in such a way that makes it easier for employees to be healthy. To help employers decide what changes to make and what their options are we created a free online tool called the Checklist to Change. This tool starts with a really short worksite audit helps you identify the things you’re doing well in the policy and environment changes that you might need. Then it gives you information and resources that you and your wellness committee will need to implement these changes. 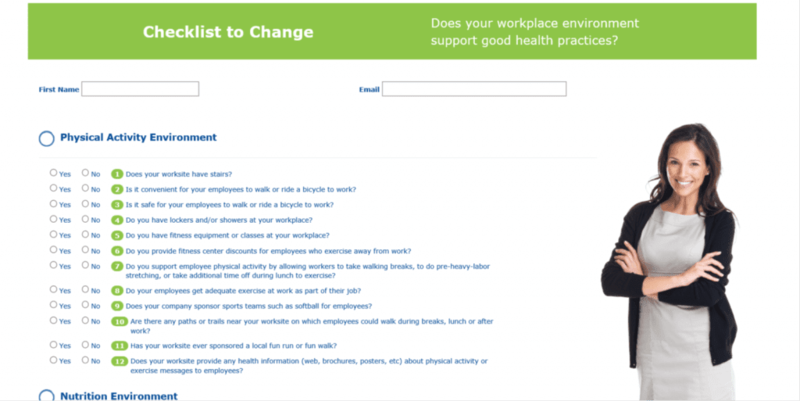 Any worksite can use the checklist to change. It is located here. We encourage every WellSteps clients to use the Checklist to Change. Every quarter the wellness coordinator and the wellness committee will use the results from the checklist to identify one policy or environmental factor that they can change in the next three months. Using this process every client is able to improve the worksite environment and policies by making small and consistent changes and improvements. One or two small environmental changes may not initially have a big effect on employee behavior. But after a consistent effort over two or three years, anyone visiting the worksite instantly recognizes that employee health is supported at this workplace. Humans are very social creatures. We depend upon each other for many things, including our attempts to be healthy. Spouses and significant others are perhaps the most important part of a successful behavior change effort. Is is possible to change behaviors without the help of others, but it is extremely difficult. It is easier to be healthy when someone is joining us on this journey. Social support can include more than just spouses and significant others. It can include coworkers, professional colleagues, friends, neighbors, church groups, and even pets. Yes, a dog can provide an enormous amount of encouragement and support for taking a daily walk. Dog owners know what I’m talking about. Dogs love to go for walks and dog owners feel obligated to take them. I call this puppy peer pressure. Spouses and significant others should be able to participate in your incentive plan, team competitions, lunch and learns, and they should be receiving your wellness newsletter and emails. They should be invited to participate in as much of the wellness program as possible. The best employee wellness programs recognize the importance of social support and do everything they can to help employees get help from others. WellSteps uses technology to facilitate the behavior change process. Rather than rely on a stand-alone wellness web portal for information, the wellness program is an interactive behavior change platform that uses social media, video, weekly tasks, quizzes, team competitions, goal-setting, reminders, text messaging, push notifications, and incentive tracking to educate, motivate, and provide health promoting skills and tools. This leveraged technology platform provides a careful blend of user convenience and face-to-face interactions with other program participants. Behavior change campaigns are 4-6 week challenges designed to improve health behaviors and build self-efficacy by reducing the behavior change process to manageable weekly tasks. They may include short videos, simple quizzes, games, materials, wearable device integration, demonstrations, team competitions, behavior change strategies, incentives, and peer support. For example, in the Move It Coast to Coast campaign, participants work together as a team to support each other in engaging in physical activity as their team competes with others to “race” across the United States. This campaign uses each of the behavior change strategies and social support to help all team members increase physical activity and applies technology to track progress and enable communication within and between teams. Besides the use of technology, this wellness campaign requires considerable leadership support for wellness. Company leaders must decide to make creating a healthy workplace a priority. Budgets are created and time is allotted to all employees and significant others to help them with everything they need to change behaviors. Four months before any behavior change program is launched, a marketing campaign was initiated. 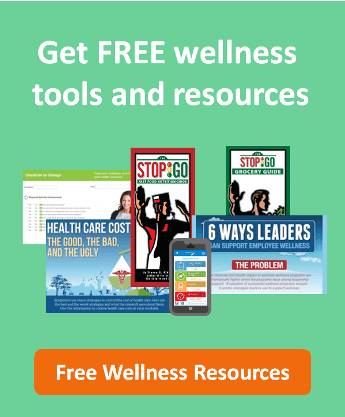 These campaigns may include visible leadership support for the wellness program, posters, postcards, emails, newsletter articles, blogs, and department announcements. Introduction to and explanation of the wellness program is made to all employees during required work meetings. 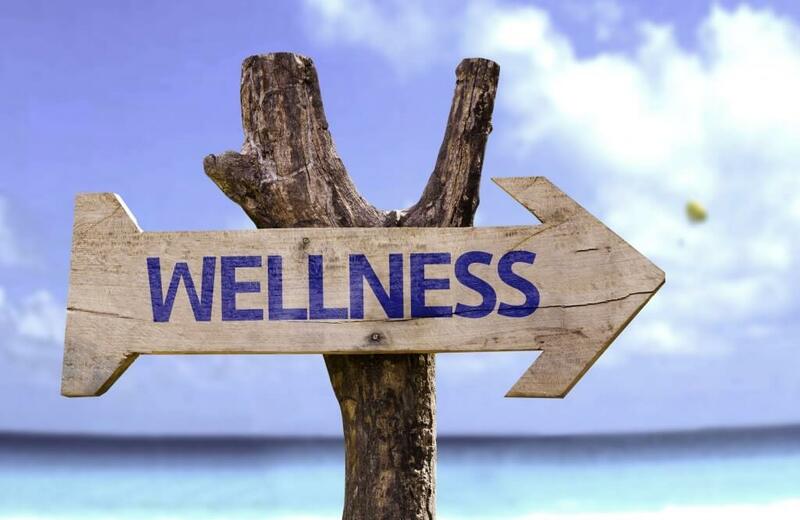 Throughout the year, the wellness committee and company leadership are engaged in improving the worksite culture and enviornment by making it easier to be healthy. Every aspect of every behavior change campaign is guided by the AMSO behavior change model. After spending the majority of my adult life researching the effectiveness of worksite wellness programs, it was easy to see that the behavior change approach to wellness was the only realistic approach that would work. The scientific literature supporting the effects of behavior change is overwhelming. The challenge has been to integrate this science into the worksite setting. WellSteps and the nation’s best worksite wellness programs have embraced the AMSO model. It is the only model we use with our wellness programs. Everything we do is grounded in at least one of the four main features of this model. Our entire business model is based on the premise that this model changes employee health behaviors, reduces health risks, and produces positive wellness outcomes. After 10 years and dozens of research publications we now have proof that this approach to wellness works. Not only have we published a variety of real-world research publications, but we recently received the Koop award, acknowledging this program as the best wellness program in the United States. If the goal of your wellness program is to improve employee health and reduce employee related expenses, the only realistic solution will require helping employees adopt and maintain healthy behaviors. This is how wellness programs work if they are to be effective. Behavior change is the secret to success for the all of the best employee wellness programs. Programs use awareness and education, motivation, skills and tools, and changes in the environment and support from others to help employees create new, healthy habits. Successful behavior change is hard to do, but it is the only way wellness programs will produce positive wellness outcomes.